I rarely eat at a steakhouse. For the most part, I tend to think steakhouses are masculine, darkly lit places that just care about large slabs of well-marbled beef. 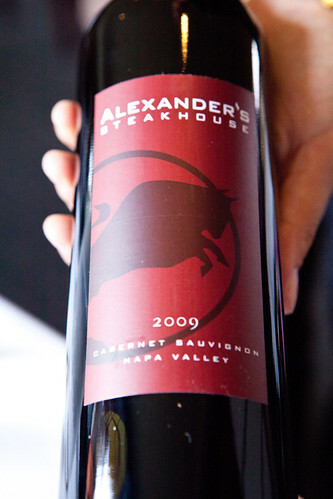 Except when I visited Alexander’s Steakhouse in San Francisco with my family very recently, I will make an exception. 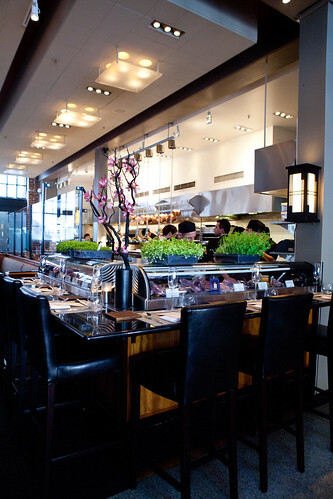 Alexander’s Steakhouse is a contemporary, urban, handsome, upscale steakhouse and if you do look at their food menu, it has Asian touches. 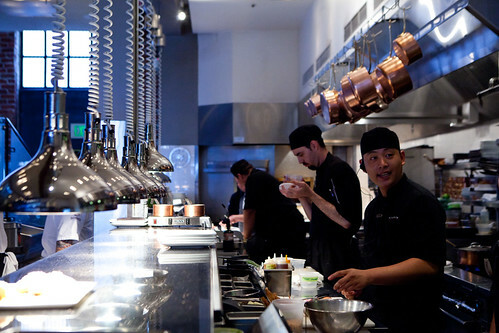 There’s exposed brick walls, booth tables and open kitchen that define the restaurant’s loft-like space. There is an upstairs dining area that is slightly more private dining area that floods in lots of great natural light (that’s where we sat) and a separate dining room. Service was professional yet friendly and not intimidating. 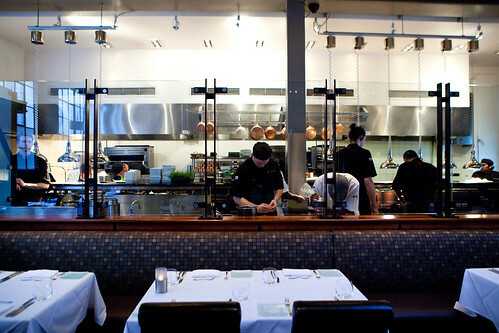 When I walked around the restaurant to photograph, I did see the Chef’s Table. 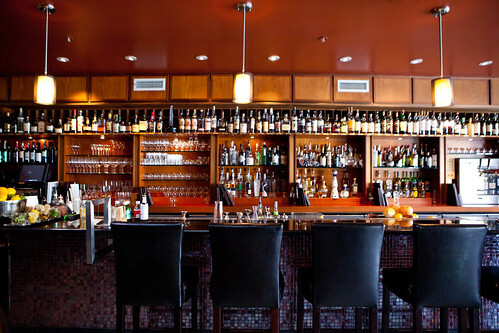 I was informed that this particular corner is like a steakhouse version of what one would encounter at a sushi bar. One would make a reservation and have dinner at this bar; served and may interact with the chef the entire duration of your meal. Also, one of the chefs prepping the restaurant’s signature Hamachi shot (seen here) was kind to allow me to enter in their precious space to shoot around for a bit. 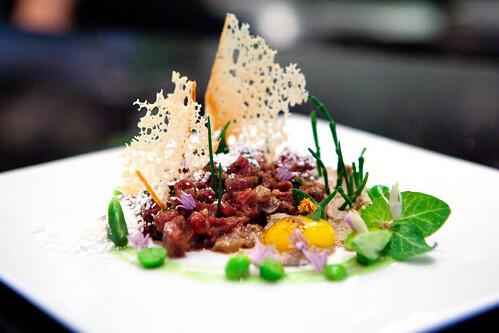 Interestingly enough, Chef de Cuisine Marc Zimmerman was working at the time and showed to his colleagues a new dish, the beef belly tartare (the photo above that’s plated with delicate fricos and raw egg yolk). The earlier mentioned chef let me sampled the tartare itself and it tasted like beef bacon. Like any tartare dish, it’s raw. But there’s a smoky element and it’s delicious and unique. 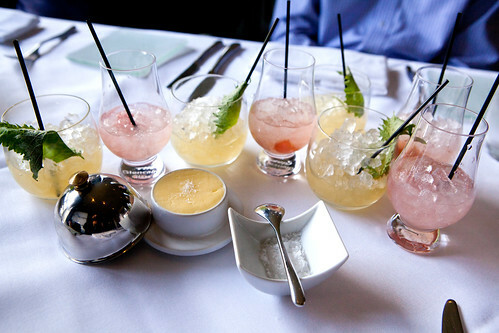 We had a round of two cocktails – a vibrant, citrusy Shiso Bomb and a refreshing Gunner with an amuse bouche that has a texture of soft pâtes de fruits made of eucalyptus, cucmber, yuzu, and yuzu gel. 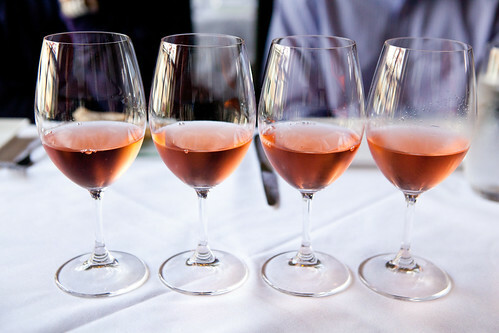 A good refresher to the palate and it does reflect on the summer season. 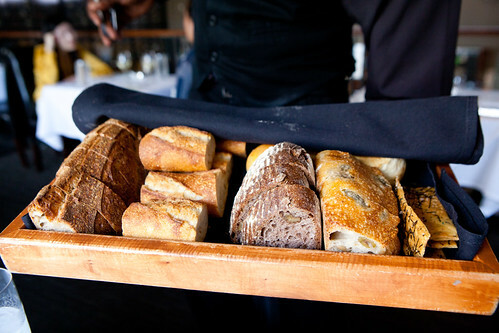 The bread service was good. They source most of their breads from Acme but started to bake their own, namely the bacon roll (which does needs some tweaking, as it does lack bacon flavor even though there were a good amount of bacon bits within) and the addictive seaweed flatbread. We ordered the 6-pack of the “Original” hamachi shots ($24) according to our waitress, it’s a 31-ingredient shot that has some of the following ingredients: sushi-grade hamachi, avocado, red Fresno chili, pickled ginger, arare rice cracker, sesame seed, radish, truffle oil, ponzu, and green onion. 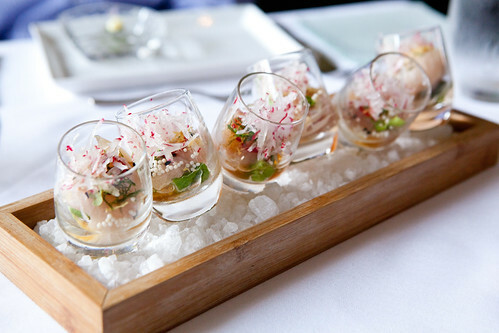 Overall it’s a refreshing, large shot of cool, silky hamachi, with crunchy bites of radish and rice cracker with a truffle aftertaste. 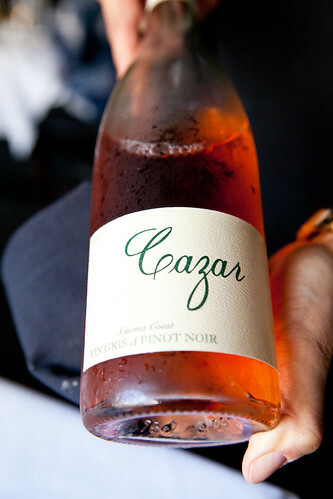 We requested our waitress to pair our next course of Broken Beets ($15 each plate, ordered 2), and she thought up of Cazar Cellars Vin Gris of Pinot Noir 2010 ($12 per glass). This wine was very quaffable. The nose is full of red fruit and floral tones with spice and tea essence as well playing to a bright and tangy palate of fresh plum, raspberry and cherry fruits while hints of truffle, pepper, in the background. Hints of toasty oak frame this zesty wine. 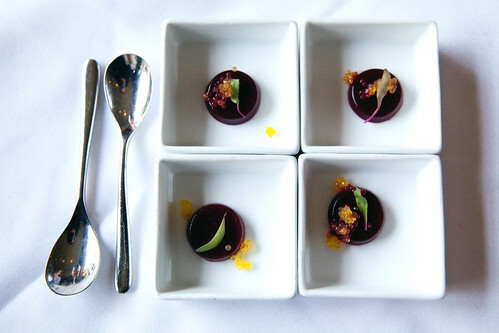 The Broken Beets were plated with King crab, fizzy campari, caramelized almond-miso butter. 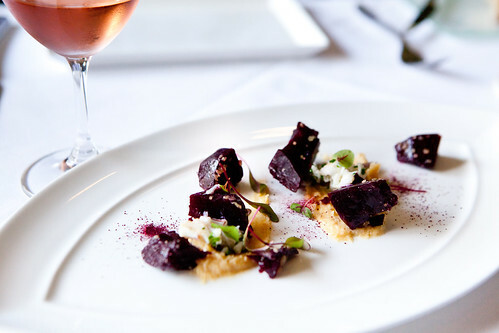 The reasoning behind the name of this plate is because the beets were roasted then frozen with liquid nitrogen and smashed with a hammer or mallet. The beets were pretty darn delicious. 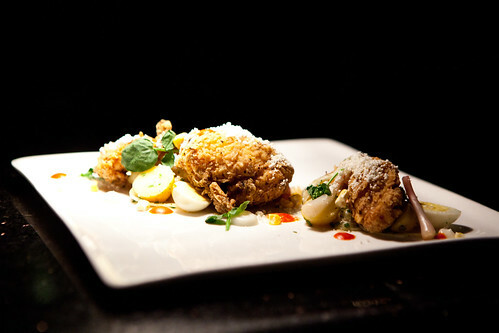 Sweet, great depth of flavor as the sweet crab and the Pop Rocks-like candy was hidden within the dish. It’s a fun, tasty dish. Just to get our fill before California’s ban of foie gras (and chefs trying to convince the legislators to repeal), we ordered their Duo of Foie Gras ($46) that is we ordered both their hot and cold preparations. 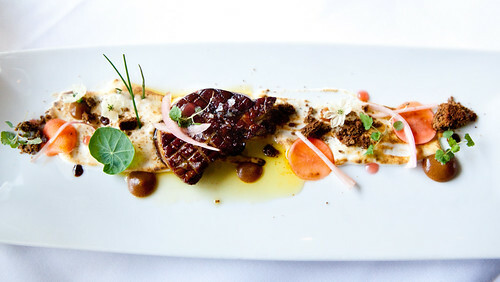 The hot seared foie gras was a fun, refined take of liver and onions. 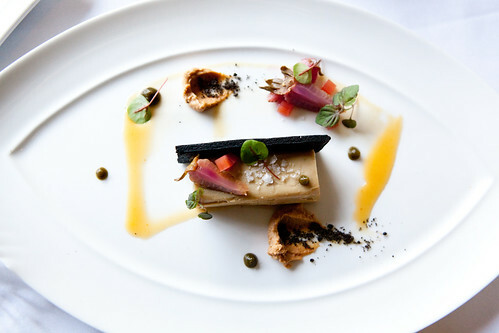 The foie gras was wonderfully seared and the sweet caramelized onions made it amazing. 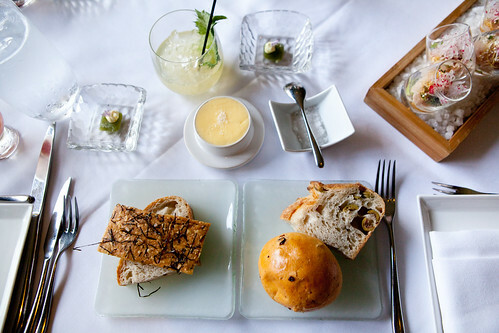 The cold foie gras was buttery and luxurious by itself. But with the lychee miso, basil gel, basil black garlic sable, pickled onion, strawberry cubes, and rhubarb, it’s a taste of spring with the fruity, slightly tart accompaniments on the plate. We asked our knowledgeable waitress for another pairing to go with our steaks and she came up with the restaurant’s namesake Cultivar Cabernet Sauvignon Cuvee, Napa Valley 2009 ($18). It’s a big Cabernet with tannins and lush cherry and blackberry flavors that can stand up to our two chosen steaks for the evening. 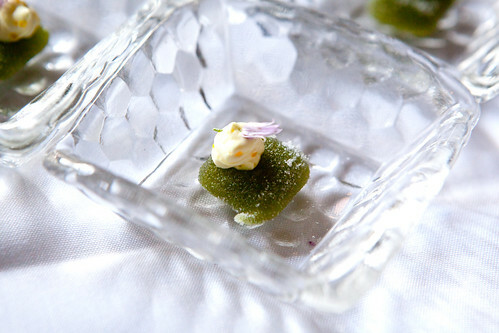 We were also presented with a palate cleanser of sorts, a small, round disk blackberry gelée topped with fine pineapple-kumquat pearls, and micro lime basil. An almost creamy gel that’s fruity and acidic enough to clean out the palate. 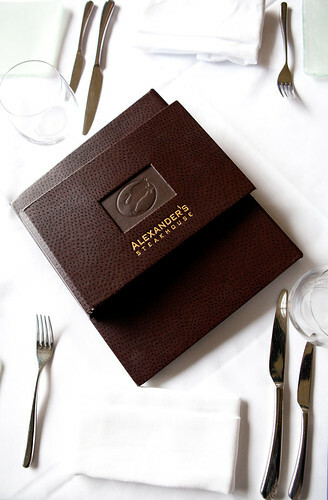 The sole reason why you should go to Alexander’s is really for their incredible steaks. 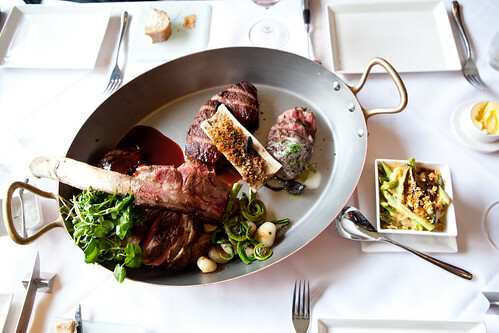 Since we ordered two different cuts (the “Perfect Porterhouse” ($95) and Prime Tomahawk Chop ($78)) and share between the four of us, the kitchen elected to serve this in a gorgeous stainless steel-copper oval roasting pan. Stares of awe from neighboring tables when a waiter and a chef walked up slowly to our table with this beautiful platter. 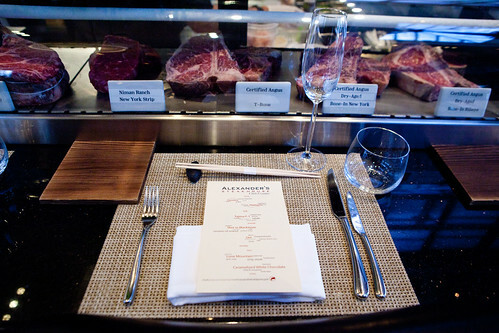 The porterhouse is a Niman ranch strip steak and a petite filet mignon, served with a bone marrow. 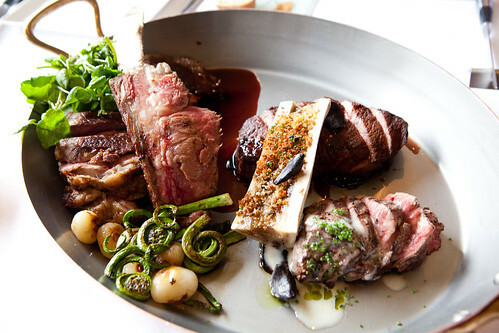 The Tomahawk Chop is a charcoal roasted giant ribeye topped with watercress beurre blanc and a side of fiddleheads. Both steaks were simply a carnivore’s dream. The steaks were perfectly cooked to a medium-rare. 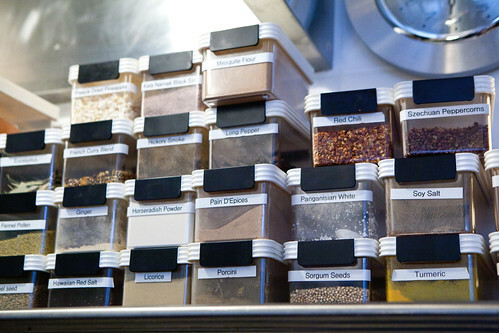 Everything was perfectly balanced in flavors and not being overtly heavy. My dad is the most carnivorous of the family and he said that was his favorite and memorable dish of the entire trip. Somehow we had some room for dessert, we opted for the Tropic Thunder ($12) plated with arare rice crackers, passion fruit pepper sauce, vanilla pineapple chutney, rice pudding, a quenlle of mango sorbet and drizzled with a coconut rum sabayon. This dessert transported me to somewhere in the warm Caribbean islands. 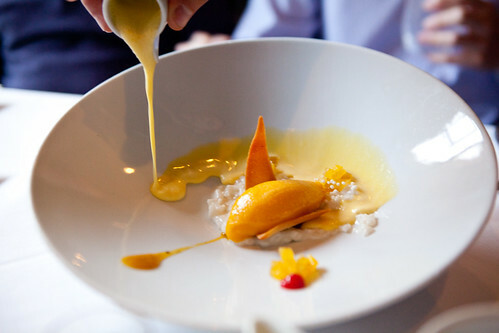 Each bite was silky, smooth and intensely flavored of mangoes, pineapples and coconut. 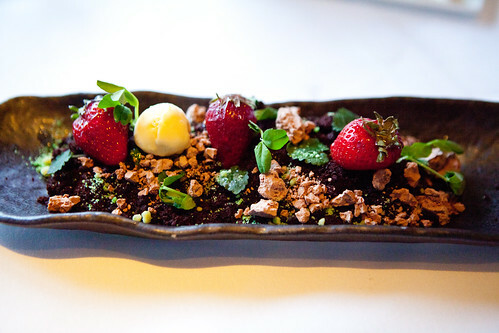 The other dessert we ordered was the Ichigo Patch ($12) strawberry mousse, black velvet “soil”, vanilla ice cream, chocolate “rocks”, streusel, topped with delicate spring greens. It looks and tasted like a strawberry patch with a touch of chocolate. It’s a playful dessert that doesn’t skimp on flavors and textures of creamy, crunchy, cold and warm temperatures. 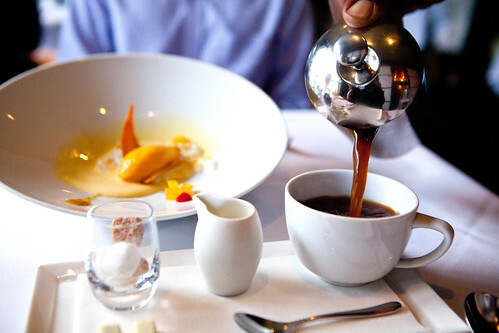 Pastry chef Daniel Huynh is doing great things with their plated desserts and I’m a fan. Since it was a long day of playing tourist for us, we ordered a large pot of Equator’s Ethiopian coffee (French press; $16). Light-bodied, slightly syrupy and fruity. A good way to cap this amazing meal. 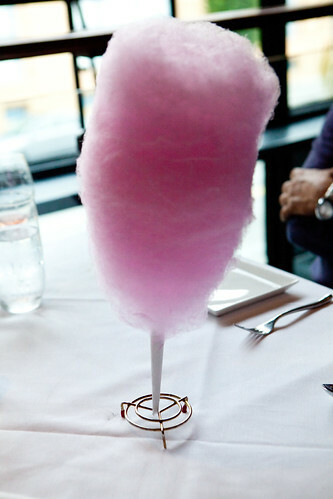 I should note the nostalgic cotton candy (gratis to each table) was presented a bit prior to the plated desserts. 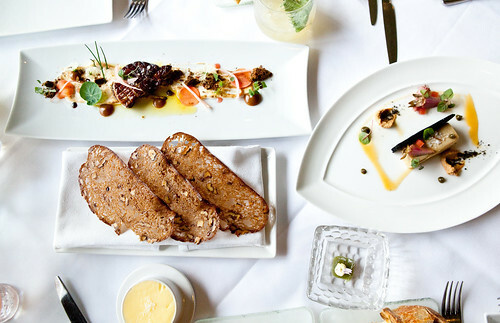 Sweet, fluffy, and it evokes happy feelings to the table. Leaving the crowded restaurant (it was a Saturday night when we visited) with happy and full stomachs. 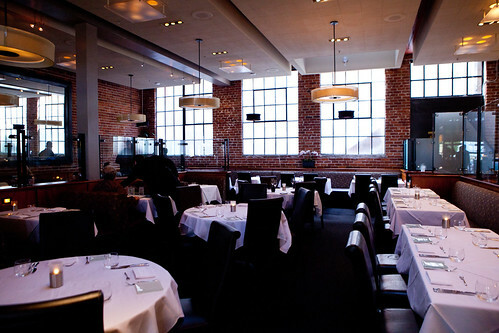 If I do visit San Francisco again and craving a fantastic steak and dessert, I would come back here.